Customers in Horsham and the South of England make us their first-choice drainage consultants because we know sewage treatment systems inside-out. 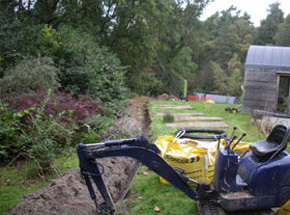 We provide annual maintenance contracts to support our septic tank installation services and our experienced professionals offer practical help and advice over the telephone should you encounter any future difficulties. With Flowrite Drainage Services, our customers are always in the best possible hands. Our Horsham-based drainage consultants cover all domestic and commercial requirements throughout the southern counties of Sussex, Surrey, Hampshire and Kent. Free site surveys and written quotations are available with the promise of competitive pricing and an outstanding approach to customer service that’s become the hallmark of our business. We use the latest CCTV technology to perform thorough inspections that identify all drainage problems quickly and simply. 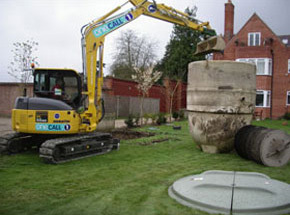 Although much of our work is centred on the installation of septic tanks in the South of England region, our consultants deliver a full range of professional drainage solutions that keep properties in a healthy and sanitary condition at all times. We have a highly specialised team that provides pressurised water jetting services, we replace full sewage systems and we specialise in radio tracing. Our extended service range reinforces our position as a leading independent drainage specialist. If you would like to know more about our services, or if you have ongoing issues with your drainage system that require immediate attention, call our drainage consultants in Horsham today. We cover the entire Sussex, Surrey, Hampshire and Kent areas to ensure all customers throughout the South of England receive the same high standards of service that earn us many new referrals and unprecedented levels of repeat business every year.